Home › WWWS › Is Opi real? It happens at books groups that someone asks if Opi is real. Oh yes. And it has been real for a long time, as the site Opionline can tell you in English and Italian. 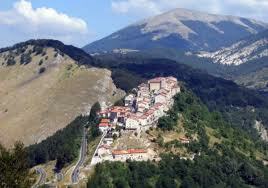 Altitude 1250 ft, current population 500, it sits on a plateau between the Sangro, Fondillo and Fredda valleys. People have been living in, on, and near Opi since Paleolithic times (as Carlo points out in Chapter 1), and the name may come from a pagan goddess of abundance (wishful thinking) venerated by the ancient Maris and Samnite peoples. Or not. “Opi” could be Roman, from the Ope, wife and also sister of Saturn (we won’t go further on this point). Or from a priestess of a temple of Vesta for which Opi was considered a sacred village. Or maybe not. Maybe from the Latin “oppdium” or fortified castle. Anyway, Opi got itself a name. And then the trouble began. In medieval times, command of the valleys and towns was hotly contested by local lords, various invasions from the north, brigands, feudal powers and constant quarrels with neighboring, somewhat larger Pescasseroli. Shortly after the time of my story, mid 1880’s, the exodus to America began, with 500+ people leaving over the next 15 years. On July 31, 1901, a horrible earthquake struck the town. Emigration from the hill towns throughout the 20th C continued the population drain, although tourism, particularly eco-tourism and cross-country sking is bringing back some young people. The last time we were there the town was in a fury of excitement to welcome home one of their own who had just won the Italian cross-country ski championship, seizing it from the northern Italian, heavily sponsored skiers who suffered a major blow to their sense of entitlement. Hah!